My humble foray into vertical gardening began with this first project, so it is very near and dear to my heart. 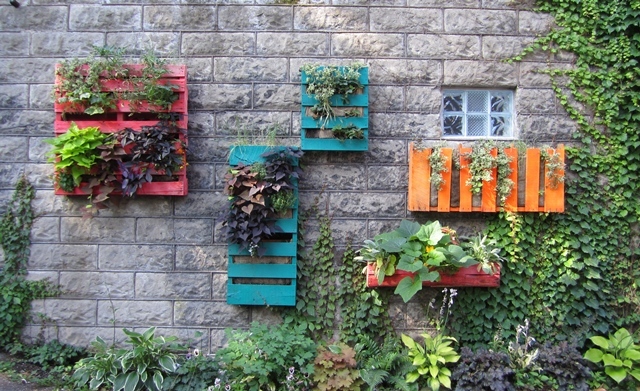 The pallet garden is a fairly simple way to create a large vertical garden. The steps to build one are easy, and involve a pallet, small fabric liner (to contain the soil) and enough lightweight soil to fill the pallet. It’s a project you can easily complete in an afternoon. Though don’t forget to let the garden sit horizontally for a few weeks before hanging it up! This gives the plants much needed time to establish themselves, so they do not fall out when turned vertically. Another internet DIY favourite of mine is using reclaimed materials is the eavestrough garden. There are many versions of it online, but my favourite is a part of the Growing Vine Street project, created and designed by Seattle artist and activist, Buster Simpson. In this project downspouts are utilized and altered to grow plants. All irrigation is from the downspouts alone, which diverts some roof water drainage before it reaches the storm sewers. The pop bottle garden is another great example of how to reuse waste material to create vertical gardens. This garden was originally installed as a part of the Home to Home (Lar Doce Lar) program in collaboration with Rosenbaum Design Firm and Brazilian TV personality Luciano Huck. Because this garden was created in a private residence, small vegetables (mostly leafy greens) and a few herbs were planted in the bottles, though a variety of smaller plants could easily grow in the bottles. The garden has become so popular that Rosenbaum has released a guide on how to make your own. A simple and inexpensive design, this system is a popular summer activity for children. 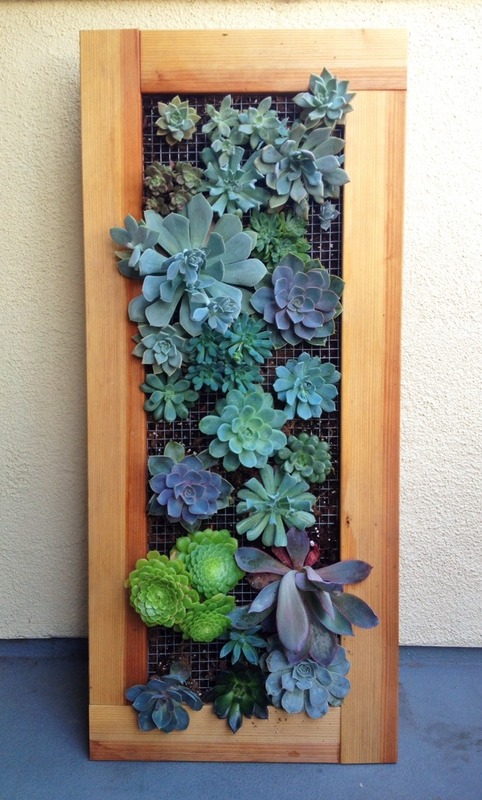 It is very easy to repurpose old frames or boxes into vertical gardens. Kari Scott, a graduate student of landscape architecture at UPenn makes her own vertical gardens regularly. 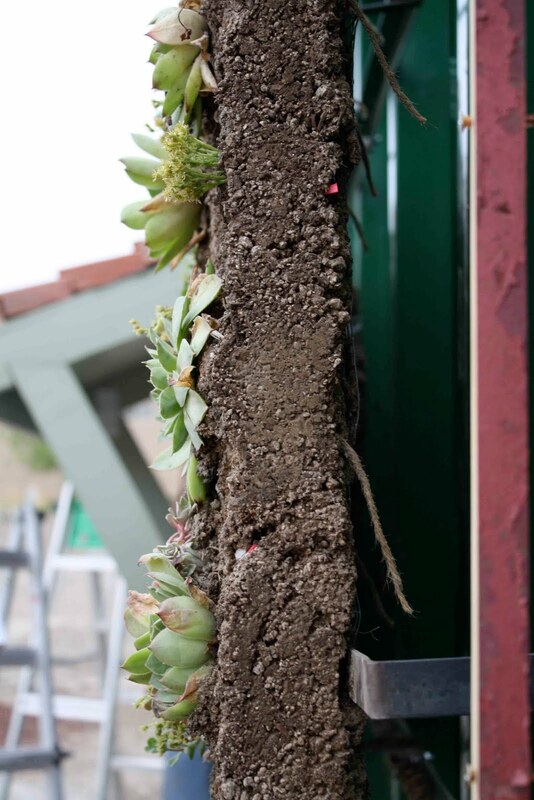 She builds her own frames and uses succulents to fill them, due to their relatively small root systems. Other plants could be used, but may require more soil, adding weight and bulkiness to the design. Some plants will do better in a vertical orientation than others, so trial and error is the way to go to figure out what is best in your climate. There are many ways to make beautiful vertical gardens, I hope you’ll experiment with your own designs! Various tutorials are available online for the projects listed above and many others. Maybe you will add your own special twist and post it in the comments below, for others to see? Leading Image ©Tamara Urben-Imbeault. Repurposed dresser drawer filled with Nasturtium and Strawberry plants. Both of these plants did very well vertically. Written by Tamara Urben-Imbeault, M.L.Arch. graduate from Winnipeg, Manitoba, Canada. Her main area of research is vertical gardening. Read her thesis, “Vertical Gardening in Cold Cities; Speculations for Winnipeg” here. Many vertical gardens are maintained by someone other than the building owner. Various vertical garden distributors offer maintenance packages that cover differing amounts of time. If a maintenance contract is signed, it is very important that the duration and scope of the work is well defined. Many vertical garden companies will send employees to the site to perform maintenance, but sometimes it is also necessary for one site maintenance staff to check systems themselves. At times like these, that the maintenance contract must be explicitly detailed. If vines are involved, must be trimmed once or twice a year, to prevent growth over windows or other undesirable places. PLEASE NOTE: This article is not a complete guide to caring for your vertical garden. 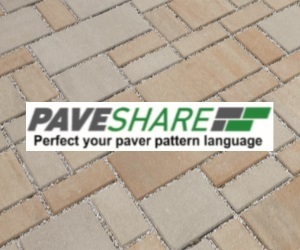 Always follow manufacturer and/or designer’s instructions. This post is simply a small glimpse of the maintenance you can expect with a vertical garden, it is by no means a comprehensive guide. Recently many designers, artists, horticulturalists and biologists have been busy designing and building vertical gardens across the world. Throughout the research I have undertaken for my design practicum (thesis) in Landscape Architecture, I have formed a preference for certain designers. Below are some of my personal favourites. Of course, at the top of the list is Patrick Blanc, famed biologist and vertical garden genius. I enjoy his work a lot, not only because of the aesthetic beauty that his projects have brought to a variety of cities worldwide, but also because of his humble beginnings. Ok, it might also have a bit to do with the fact that he dies his hair green, too, cause how cool is that?! His first experience with vertical gardens happened a trip to Malaysia where he visited natural cliffs and was fascinated by the were colonized with thousands of different plants. He took this inspiration home to Paris with him, and began to experiment with a fish tank and hydroponic planting systems. I admire the development and experimental nature of his mur vegetal which has evolved into quite the commercial success. Josh Rosen, known by his professional moniker of Airplantman, is another favourite vertical garden designer. A trained landscape architect in California, his projects are an elegant minimalist approach to vertical gardening. He uses air plants, or tillandsia only to colonize his AirplantFrames. He builds clean lined frames with wire grids from which he suspends the tillandsia. His AirplantFrames are reminiscent of framed images, and remind me of the tillandsia that I have seen growing in the wild, which seem to grow on anything, especially power lines. Part of the reason I love Rosen’s work is because of my obsession with air plants, and the minimalist aesthetic that he works with. 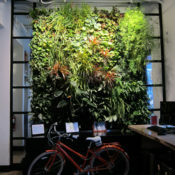 My favourite Canadian vertical garden designer/company is Nedlaw. I admire how Alan Darlington was able to translate his research for NASA into a viable commercial enterprise. As the only company in Canada that offers a biofilter. Of course, because my practicum is primarily research-based, I have also developed a real appreciation for those who are doing, or have done, quantitative research on vertical gardens. Amongst those people are Dr. Brad Bass, a professor at the University of Toronto and Dr. Manfred Köhler, professor at the University Neubrandenburg. Even though I only met him once, Dr. Brad Bass has been an integral part of my education in vertical gardening. He was a co-author in the largest research document the Canadian government has undertaken on vertical gardens (LINK), and was the instructor of a workshop I attended in the summer of 2012 that was put on by Green Roofs For Healthy Cities (GRHC) called Green Walls 101. I have never met Manfred Köhler, but it seems like his name has been all over all the research I have been doing for the last year. In fact, I just requested a copy of his thesis through my university’s document delivery service, and I am excited to read it… Even though it is in German. Luckily, the chair of my committee is also German and can help me translate. Köhler’s work has been paramount in the scientific analysis of thermal qualities of vertical gardens. As you will surely recall from the Vertical Gardens: Throughout The Ages post, he was also involved in the writing of the FLL (Forschungsgesellschaft Landschaftsentwicklung Landschaftsbau Richthimie für die Planning, Ausführing und Pflege von Fassadengegrüngen). The funny thing about this pair is that they have collaborated on work together as well. I would have loved to have been a fly on the wall for those conversations! This post concludes the Vertical Garden series, thanks for reading! First honourable mention goes to the Bosco Verticale, which has gained a lot of media attention in the last couple of years. A project by Boeri Studio, the concept of the residential towers is to build a vertical forest in the city of Milan. Currently under construction, this project will host a whopping 900 trees, various shrubs and floral plants at elevations up to 110 meters in height. On flat land, the Bosco towers would equal 10,000m2 of forest, and 50,000m2 of single family dwellings. Though the concept of growing trees on buildings is nothing new (see Friedensreich Hundertwasser’s tree tenants) I think this project is worth mentioning because of the sheer volume of trees it will host. In 2010, the EEA (European Environment Agency) office in Copenhagen decorated the front of their building with a map of Europe in celebration of the United Nations International Year of Biodiversity. The map shows the ecozones of Europe, and was planted using different annual plant to differentiate the zones by their colour. Though this project was only on display for one summer, it remains an integral project to this list. It demonstrates how vertical gardens can be used as educational tools, as well as tools to enhance the biodiversity and beauty of a city. Another innovative, but less known vertical garden project was created at the University of Oregon by students Matt Brook and Walter Cicack. The project was completed during a design build studio called Horticultural Building Systems, lead by professor Richard Hindle in 2010. The wall is made from a single 3” slab of a custom mix of concrete and growing material. The mix was refined during the studio to be light weight enough to affix to the side of a shipping container, and strong enough that it could hold itself together. The wall was designed to accommodate a couple of grown varieties of sedum, as well as a grass and wildflower seed mix meant to fill out the wall over time. This project is a very interesting leap from the somewhat more traditional notion of a “planter brick,” wherein a modular concrete brick contains an open area for the growing medium and plant inside of it. This system combines the two traditional materials (concrete and soil) into one new hybrid growing medium. It is unknown whether the plants have survived over the years, or whether the seeds were able to successfully germinate. The Sportzplaza Mercator in Amsterdam is one of the more impressive vertical gardens I’ve seen. The building is a community centre with a variety of pools for therapy, fitness, aerobics, together with a cafe, party centre, childcare centre and fast food restaurant. During community consultation, VenhoevenCS and OKRA were told by the community that they wanted the building to be “as green as possible” so the architects took that idea literally: the building itself is an undulating landscape of green roofs and walls, with plantings only interrupted by windows and doors. Every available surface appears to be planted. It is purely magnificent to behold. 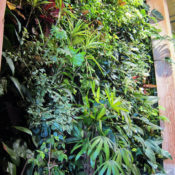 Vertical gardens, although generally quite unsustainable and expensive, can be used to generate energy. One such project is the BIQ Residence. 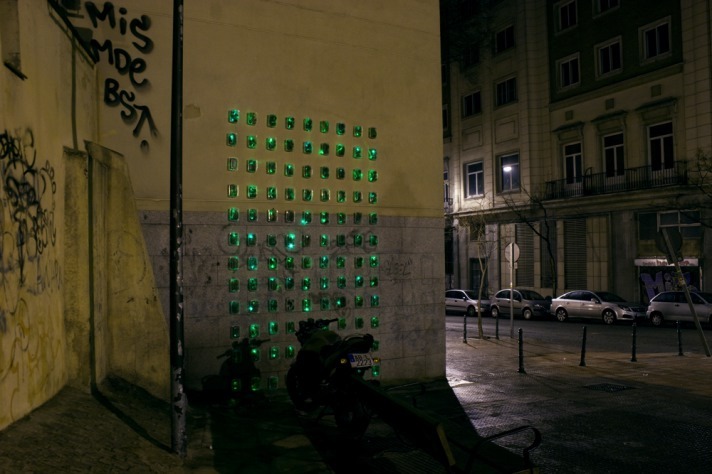 This facade, instead of growing traditional plants, grows algae. Panels of water are suspended on the outside of the building, promoting the growth of algae, which not only turns the outside of the building green, but also serves to heat the building, and to control light and shade within the building. 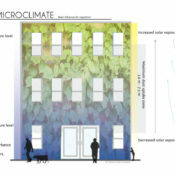 The 200 sq.m of algae grown on 2 of the facades yield 15g of dried algae per sq. meter which in turn produces 4,500 kW/h per year when converted into biogas. In today’s age of technological advancement, the Planter Brick project by Rael San Fratello Architects shows how the technology of 3D printing may be used for vertical gardening. They have designed and printed ceramic masonry bricks with openings for soil and plants. This conceptual project is a great demonstration of how traditional building methods can be adapted to accommodate a garden. Vertical gardens can be political statements as well, and in my opinion, this list wouldn’t be complete without one. 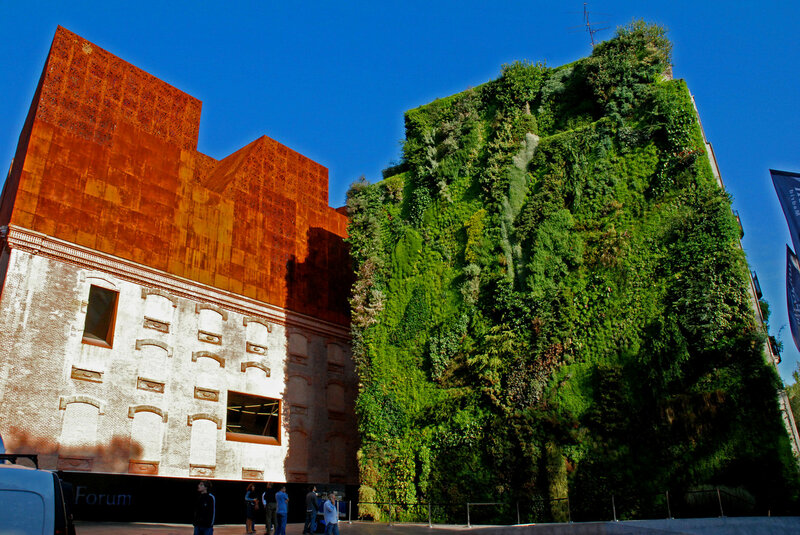 A favourite of mine is the Luzinterruptus Packaged Vertical Garden, in Madrid. The concept of the garden is to bring attention to the lack of greenspace in cities, and critique vertical garden culture. Luzinterruptus believes what people really need is accessible greenspace, not green space on the side of a building no one has physical access to. Their garden is made of plastic containers to highlight the temporary nature of vertical gardening. Keep tuned for the next post in our Vertical Gardening Series, that will be all about my personal favourite vertical garden designers! Biofilters are a relatively new and innovative technology in the world of vertical gardens that combine the fields of landscape architecture, building architecture and horticultural science. A biofilter is broadly defined as a hydroponic vertical garden that has been designed to pull air through the growing medium to filter it. (See the previous post “A History of Vertical Gardens from Simple Vines to Hydroponic Systems” for more information about different types of vertical gardens). By passing through the felt growing medium, microbes on the plant roots can filter out up to 85% of the harmful Volatile Organic Compounds (VOCs) from of the air. 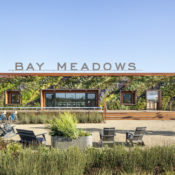 These gardens can be independent of, or built into, a building’s HVAC system. Nedlaw Living Wall at Drexel. Image courtesy of Nedlaw Living Walls. The first biofilter was designed and built at the University of Guelph Humber in Toronto, Ontario, Canada, as a collaboration between then-student Alan Darlington, and Diamond Schmitt Architects. The goal of the project was to showcase the research that was being done by Darlington and others at the school as a part of NASA’s Advanced Life Support Program. The system, installed in an atrium at the Toronto campus, is now 10 years old and continues to be an integral part of research projects on the topic. Studies of the wall have proven that reductions in levels of toluene, dust, and airborne fungal spores result from the installation of a biofilter. One of the big advantages of this system is that no toxic waste by-products are created through the filtering process. The use of an open air hydroponic system exposes microbes present around plant roots which feed off of harmful VOCs, removing up to 85% of them in a single pass. Most of the plants used in biofiltration are tropical plants commonly found in homes around North America such as Ficus benjamina; Philodendron selluom; Umbrella Plant, Shefflera arboricola; Rubber Plant, Ficus elastica; Dracaena spp. ; and Ivy, Hedera algeriensis, among others. Biofilters, like all other hydroponic walls, are planted with plants that have already been started in a greenhouse, so the result is immediate. As with all living landscapes, die off and disease do sometimes occur, so regular maintenance is necessary. Depending on the types of plants used, and their propensity for disease, 90% of the plants will usually establish themselves successfully. On average, monthly maintenance is recommended to check plants for disease and die off, and weekly checks are necessary to ensure the irrigation system is functioning normally. That said, the manufacturer recommended maintenance schedule must be followed to ensure longevity. Close up of Nedlaw’s Leamington Living Wall. Image courtesy of Nedlaw Living Walls. Biofilters can significantly contribute to the betterment of people’s health. Various studies have proven that living walls promote increased productivity, reduced sick days, give a better sense of well being in employees, lower blood pressure and increase positive feelings. Views to parks or green space have been proven to reduce recovery time for hospitalized patients, and it is assumed that similar outcomes would result from views that include green walls. Image courtesy of Nedlaw Living Walls. Biofilter quotes are available through Nedlaw Living Walls and are custom for each project. Stay tuned for the next post in our Vertical Gardening Series, where I share some gardens that I believe are some of the most innovative projects from around the world! Beatley, Timothy. (2011). Biophilic Cities. Washington: Island Press. Kaplan, Rachel (1993). The Role of Nature in the Context of the Workplace. Landscape and urban planning 26 (1): 193–201. Ulrich, R.S. (1984). View Through a Window May Influence Recovery from Surgery. Science Magazine. Vol 224, no. 4647. Vertical gardening in any climate can be extremely complex. The regional climate, or plant hardiness zone, is the biggest overriding climatic aspect that needs to be considered, along with the neighbourhood microclimate, and the microclimate of the wall itself. The regional climate plays a big role in determining what kind of vertical garden system is appropriate for a given site. As an example, if the site experiences a long winter below 0°C, a hydroponic system would be out of the question if the garden is to stay in place throughout the winter. These types of systems are not designed to freeze, and if they are installed in colder climates, insulation/heating or complete removal will be necessary to protect the garden during the winter. While most outdoor vertical gardens are designed for warmer climates than USDA zone 5, researchers are currently working on developing a system that works well in colder climates. If you know of, or have worked on, a vertical garden project somewhere colder, please post a comment below to share! In landscape architecture, we often plan our designs in response to, or for the creation of, microclimates. It is because of them that we are able to plant some species that would normally not be found within the given region. A vertical garden may be highly dependent on the existence of a microclimate for shelter from the wind, lower (or higher) than average temperatures, higher humidity levels, or a variety of other aspects, depending on the location. When planning a vertical garden it is important to know what kind of microclimate you are working within to determine if a vertical garden is appropriate or not, and if so, what kind of plants you should use. Some of the most important things to consider when designing a vertical garden are: the average temperature (as well as the extremes), wind exposure, sun exposure and ambient humidity and access to water. The average temperature will tell you which plants will be able to survive in your garden, and details like solar orientation and humidity or access to water will further narrow the plant palette. The microclimate of a wall is also remarkably complex, ranging from hot and dry, to slightly cooler, and to more moist. 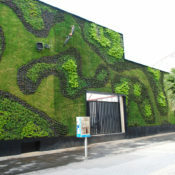 A green wall is a gradient of different climatic scenarios, and may vary from wall to wall depending on the surrounding climate and microclimate. Toward the top of the wall there is often increased solar exposure (depending on the prevalence of shadows cast by adjacent buildings), and increased wind. These two factors together frequently result in decreased moisture content in a vertical garden. There is often more shade towards the bottom of the wall (again due to neighbouring buildings) as well as lower wind speeds which result in an increase in moisture. Water within the vertical garden will also accumulate towards the bottom of the wall, contributing to higher moisture levels. The first storey of a facade will also face increased disturbance from people, animals and passing cars. Between 2 – 7.5m in elevation, dust will be captured on the leaves of the garden: If dust uptake is a priority, plant species with large leaves should be chosen, as the amount of dust accrued is directly relative to the size of the leaf itself. Climates are extremely complex and constantly changing. With global climate change, weather is becoming increasingly unpredictable, but with the aid of new technology, and programs like Ecotect and Autodesk Design Flow (pictured above), we can further study the impact of the climate on our designs. It is important that we also take the time to visit the site, and make our own notes and observations. My own personal notes and observations of naturally occurring vertical gardens (cliffs) will be the subject of the next Vertical Garden Series post, which will be published next Thursday, so stay tuned! Kohler, M., 2008. Green Facades – A view back and some visions. Urban Ecosystems 11, 423-436. Loh, Susan and Stav, Yael (2008) Green a city grow a wall. In: Proceedings of the Subtropical Cities 2008 Conference : From Fault-lines to Sight-lines : Subtropical Urbanism in 20-20, 3-6 September 2008, State Library of Queensland, Brisbane, Queensland. 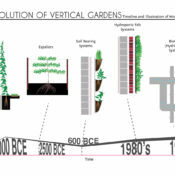 The first vertical gardens date back to 3000 BCE in the Mediterranean area. Grape vines (Vitis spp.) were, and continue to be, a very popular food crop for people in the region, so they were commonly grown in fields, homes, and gardens throughout the area. 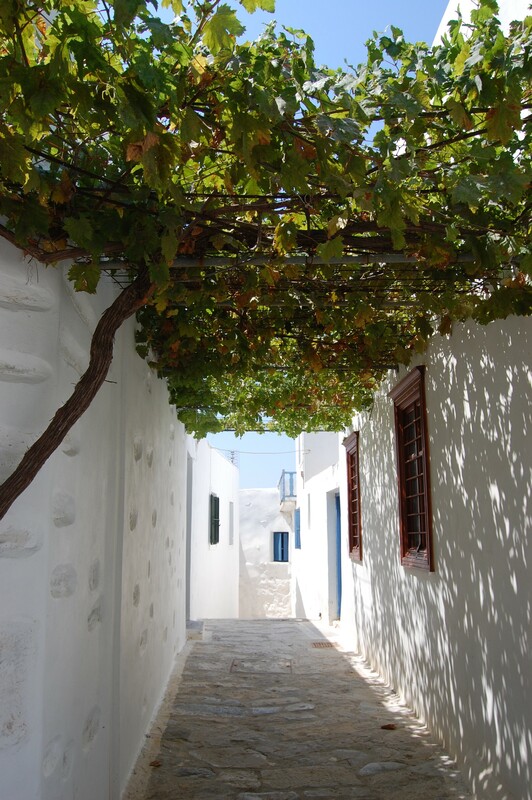 Sometimes vines were planted for the purpose of growing food, and others to simply provide shade in places where planting trees was not an option. Above is an example of Vitis vinifera that is being grown today in Greece. Hum, Ryan and Lai, Pearl (2007) Assessment of Biowalls: An Overview of Plant-and-Microbiral-based Indoor Air Purification System. Physical Plant Services, Queen’s University. Peck SW, Callaghan C, Bass B, Kuhn ME. Research report: greenbacks from green roofs: forging a new industry in Canada. Ottawa, Canada: Canadian Mortgage and Housing Corporation (CMHC); 1999.